Having trouble reading this email? View it on your browser or download the PDF. In 1992, the first United Nations Conference on Sustainable Development, popularly known as the Rio Earth Summit, was convened in Rio de Janeiro, Brazil to address the state of the environment and sustainable development. The Earth Summit yielded several important agreements including "Agenda 21", a plan of action adopted by over 178 governments to address human impacts on the environment at local, national and global levels, and key treaties on climate change, desertification and biodiversity. At the second Conference in 2002�the World Summit on Sustainable Development�governments agreed on the Johannesburg Plan of Implementation, reaffirming their commitment to Agenda 21. In 2012, the United Nations Conference on Sustainable Development, or Rio+20 Earth Summit, will focus on the Green Economy in the context of sustainable development, poverty eradication, and the institutional framework for sustainable development. The object is to renew political commitment to sustainable development, review progress and identify implementation gaps, and address new and emerging challenges. This article, and a related publication called "Keeping Track of Our Changing Environment" (UNEP 2011), serve as a timely update on what has occurred since the Earth Summit of 1992 and are part of the wider Global Environment Outlook-5 (GEO-5) preparations leading up to the release of the landmark GEO-5 report in June 2012. It underlines how in just twenty years, the world has changed more than most of us could ever have imagined�geopolitically, economically, socially and environmentally. Very few individuals outside academic and research communities envisaged the rapid pace of change or foresaw developments such as the phenomenal growth in information and communication technologies, ever-accelerating globalisation, private sector investments across the world and the rapid economic rise of a number of "developing" countries. Many rapid changes have also taken place in our environment, from the accumulating evidence of climate change and its very visible impacts on our planet, to biodiversity loss and species extinctions, further degradation of land surfaces and the deteriorating quality of oceans. Certainly, there have been some improvements in the environmental realm, such as the significant reduction in ozone-depleting chemicals and the emergence of renewable energy sources, for which new investments totaled more than $200 thousand million in 2010. But in too many areas, the environmental "dials" continue to head into the red. In the past two decades, the number of people living on the planet increased by 26%, exceeding (end of October 2011) 7 000 million. A positive, although in the short-term not directly remarkable aspect is that the population growth rate is slowly declining, dropping from 1.65% in 1992 to 1.2% in 2010, which represents a 27% decline in the growth rate over that period. One general trend in the population distribution is clearly visible: the urban population is increasing steadily, growing from 2 400 million people (43% of total population) to 3 400 million (50%) in 2009, an increase of 45%. This trend in urbanization is expressed by the 110% increase of "megacities"x (cities with at least 10 million people), from 10 in 1992 to 21 in 2010. 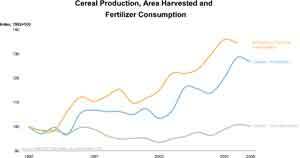 These growth rates have brought new and emerging social, economic and environmental challenges. Although the share of the urban population living in slums in the developing world has dropped from 46% to 33% as a result of improved housing and sanitation, the absolute number of slum-dwellers has increased by 171 million people, raising their number to 827 million in 2010. 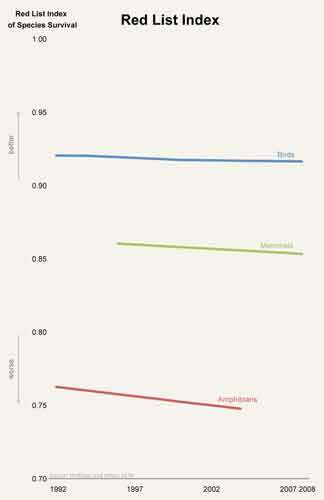 While total GDP grew by 75% and per capita GDP by 40%, there are evidently large regional and national differences (seven-fold between "developed" and "developing" regions), although growth rates were much higher in the last 10 years in developing countries than in the developed ones. At the same time, international trade has increased between 1992 and 2008 from US$ 9 to 36 million millions (an increase of 280%), before falling a bit in the aftermath of the economic crisis. As societies grow and become wealthier, demand for basic materials (minerals, fossil fuels, biomass) grew by over 40% between 1992 and 2005, from about 42 to nearly 60 thousand million tonnes. Nonetheless, there is a simultaneous decline in emissions, energy and material use per unit of output, indicating that resource efficiency is slowly increasing. At the same time, source and effect of the economic growth is a growing electricity production, increasing by 66% between 1992 and 2008, with developing countries showing more than three times larger growth rates (68%) than developed countries. With fossil fuels taking up over 80% of the total primary energy supply and their use rising by almost 40% between 1992 and 2009, emissions of CO2 increased by 38%, reaching 36 000 million tonnes in 2010. Although developing countries, through their general economic growth and many large-scale development projects, had the highest growth rates (64%), the difference of per capita emissions between developing and developed countries is still nearly a factor of 10. 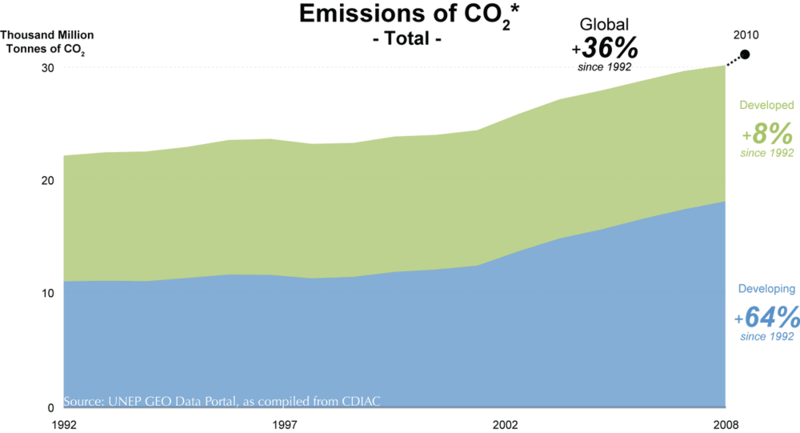 The steadily increasing amount of fossil fuels burned for generating energy and heating (26% of global anthropogenic GHG emissions, 2004), industry (19%), agriculture (14%), transport (13%) and other uses, leads to an increasing concentration of atmospheric CO2, which rose from 357 parts per million in 1992 to 389 early 2011, an increase of 9% (IPCC 2007). At the same time, global temperatures show a slow, but steady increase of about 0.2�C per decade (Hansen and others 2006). According to rankings from four top US, British and Japanese climate research centers, the ten hottest years on record have all occurred since 1998; and 18 out of the last 21 years feature among the 20 warmest years on record since (reliable) recording of temperature started in 1880 (NOAA 2011, NASA 2011, UK-MetOffice 2011, JMA 2011). As a consequence, nearly all mountain glaciers around the world are retreating and getting thinner (WGMS 2010). 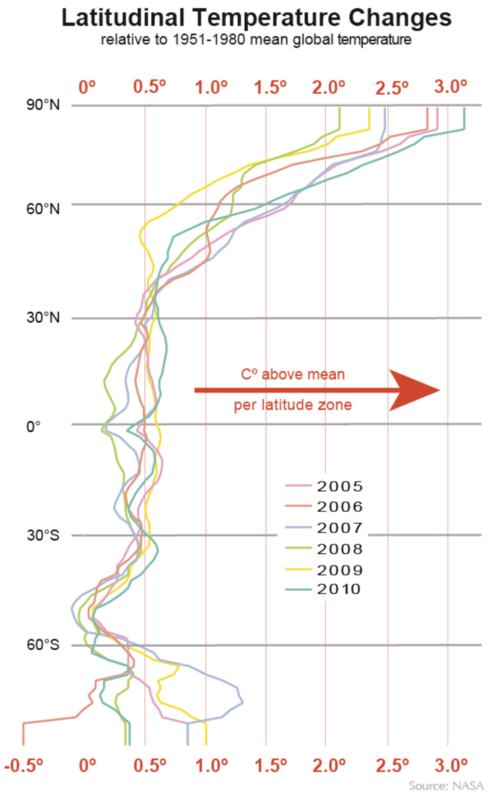 But increase in global temperature is not occurring uniformly across the globe�s latitudinal zones: far northern latitudes are seeing the most extreme changes in temperature, with increases of up to 3�C, while most of the other latitudes show variations around 0.5�. 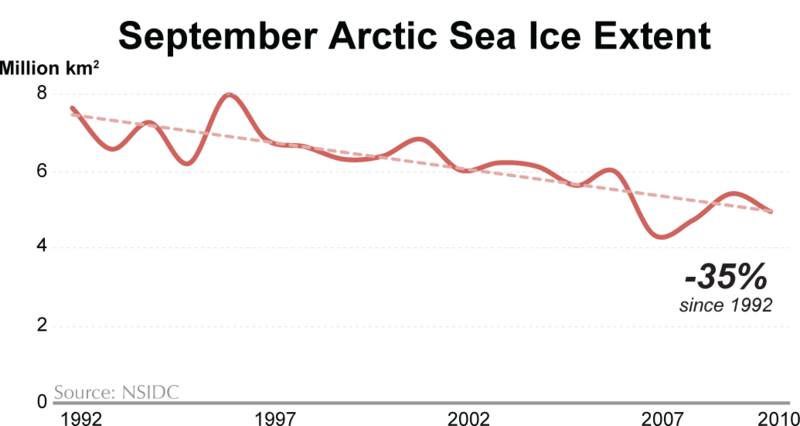 This impacts the Arctic sea ice extent, which has been steadily declining: its September extent decreased from almost eight to around five million square kilometers between 1992 and 2010, a drop of 35%. 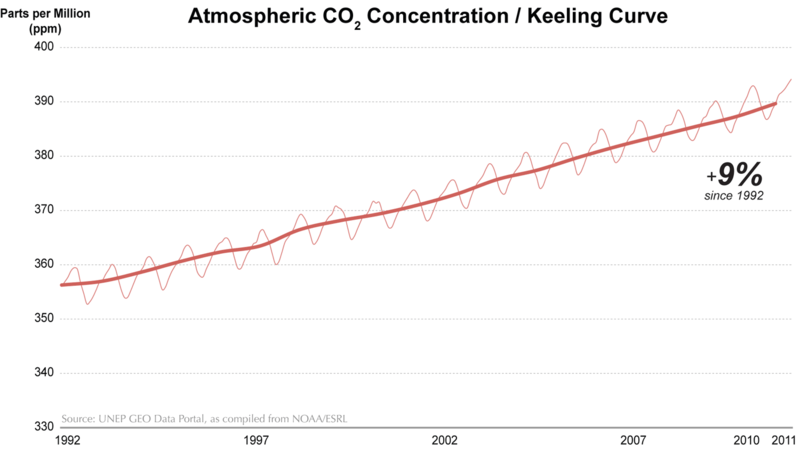 Similar to the global atmospheric temperature, the average ocean temperatures are slowly increasing too, rising from 0.22�C above the long-term average in 1992 to nearly 0.5�C in 2010. 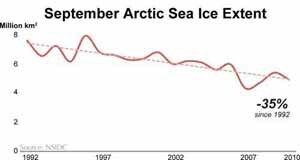 Due to this rising sea-water temperature and resulting thermal expansion, as well as the melting of ice of the Arctic, Antarctic and Greenland ice sheets, the sea level has been rising globally at an average rate of about 2.5 mm per year between 1992 and 2011 (Bindoff and others 2007). Increasing carbon dioxide concentrations in the air alter the chemistry of the ocean�s surface, causing it to become more acidic (measured by the logarithmic pH) (Caldeira and Wickelt 2003). The ocean�s pH declined from 8.11 in 1992 to 8.06 in 2007 (Feely and others 2009), having potentially significant consequences for marine organisms (UNEP 2010). Although the rate of deforestation is slowing down, natural forests declined, especially in South America and Africa, by around 13 million hectares per year between 2000 and 2010, compared to 16 million hectares per year during the preceding decade (FAO 2010). 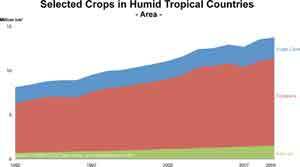 This not only results in biodiversity loss, but also contributes 12-15% to global warming (van der Werf and others 2009, UCSUSA 2011). Forest plantations, especially in Asia and to a lesser extent in Europe, have seen an increase of 54% since 1990, covering 265 million hectares in 2010. 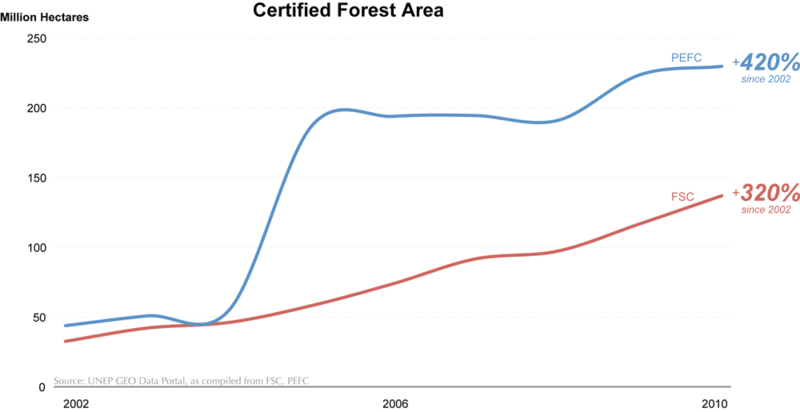 Although certification for socially and environmentally responsible forestry shows an impressive annual 20% growth rate, only about 10% of forests worldwide were managed under the two biggest labels (FSC, PEFC). With disappearing forests, industrial agriculture and sprawling urbanization, the health of the earth�s ecosystems is decreasing. 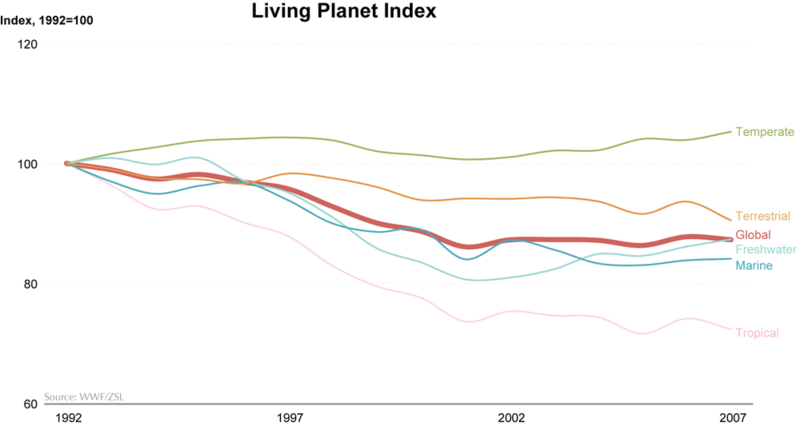 The Living Planet Index, which monitors almost 8 000 populations of over 2 500 vertebrate species, shows the most extreme decline - by 30% - in the tropical biome, and drops between 10-15% for marine and freshwater biomes, as well as in the global average. 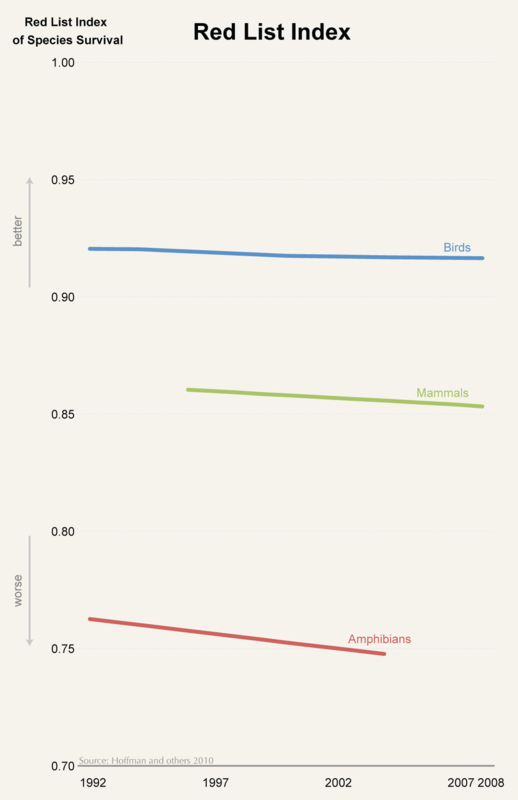 This decrease is mirrored in the Red List Index, which measures the risk of extinction, and which shows general deterioration for birds, mammals and amphibians; each year 52 vertebrate species move on Red List category closer to extinction. 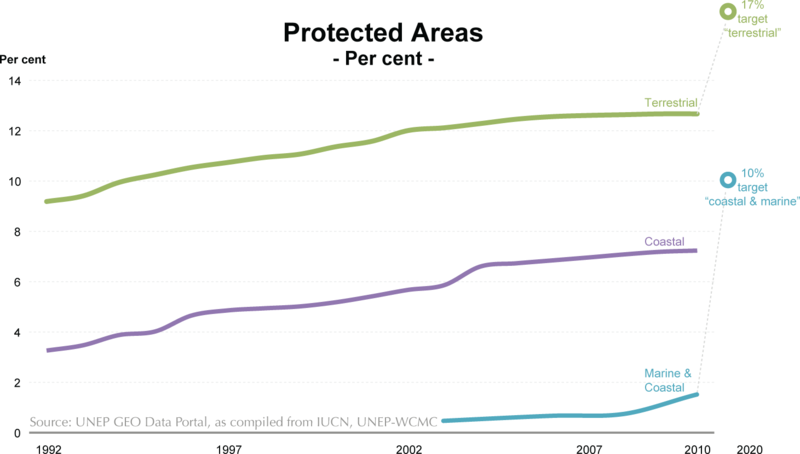 In order to halt the constant loss of species and to protect biologically important zones, the total sum of protected land areas increased by 42%, covering 13% of the continents. Marine protected areas, however, cover only around 7% of coastal waters and just above 1.4% of the oceans (IUCN/UNEP 2011, Toropova and others 2010). Since 1992, the proportion of fully-exploited fish stocks increased by 13% and overexploited, depleted or recovering stocks increased by 33%, reaching 52% and 33%, respectively, of all fish stocks. Only a small percentage of stocks, around 15%, are under-exploited or moderately exploited; these stocks, however, saw a strong decrease of nearly 50% since 1992. This degradation nonetheless was accompanied by a slight decrease in marine fish catch. But with catches of around 80 million tonnes for marine fish and 10 million tonnes (with a steady growth, 66% between 1992 and 2009) for inland water fish, the pressure on water ecosystems remains high (UNEP 2011b). Tuna, for example, is an economically important, globally-traded fish that is increasingly in demand by consumers. Catches increased dramatically, reaching 4200 thousand tonnes in 2008, an increase of 35%, leaving some tuna species on the edge of extinction (IUCN 2011, Collette and others 2011). Aquaculture could help to lessen pressure on wild fish; but with annual growth rates of almost 8% (260% between 1992 and 2009), equaling now more than half of the total wild fish catch, it is often negatively impacting the environment (via loss of mangroves, poor fish-waste management, influx of antibiotics and other reasons) (FAO 2011). Nearly 90% of global aquaculture is practiced in Asia, the vast proportion of which occurs in China. 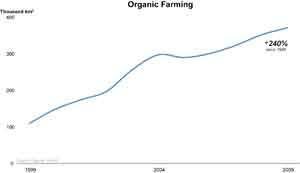 In parallel to growing production of fish, the production of other livestock and crops has been rising steadily - 45% between 1992 and 2009 - at a pace nearly two times higher than that of population (26%). 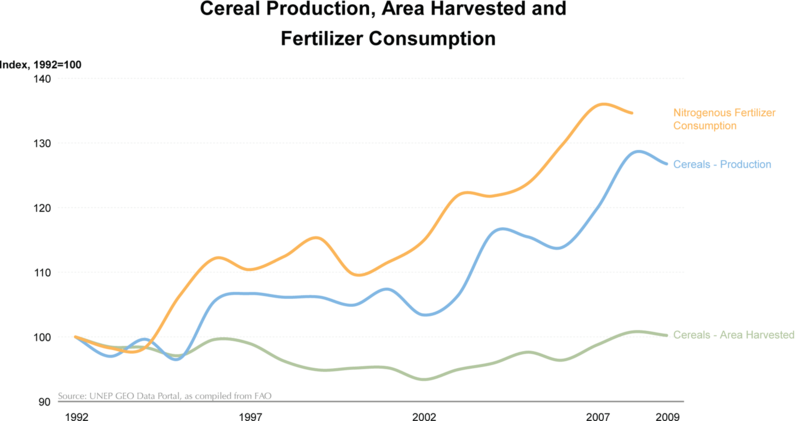 The higher yields in cereals, however, are only marginally linked to the total area under cultivation, but depend almost exclusively on intensification, where use of fertilizers plays a major role (UNEP 2011c), along with increasing irrigation. While the latter have expanded steadily (21% since 1992), it accounts for approximately 70% of total freshwater withdrawals worldwide (UNESCO 2001), it puts further pressure on already scarce and partially rapidly decreasing freshwater availability. While a few selected crops (such as sugar cane, soybeans and palm oil) have dramatically expanded in the tropics (+70% between 1992 and 2009) with negative impacts on natural ecosystems, ever-increasing numbers of grazing animals, especially goats (+45% since 1992), degrade already impoverished grasslands in semi-arid climates. 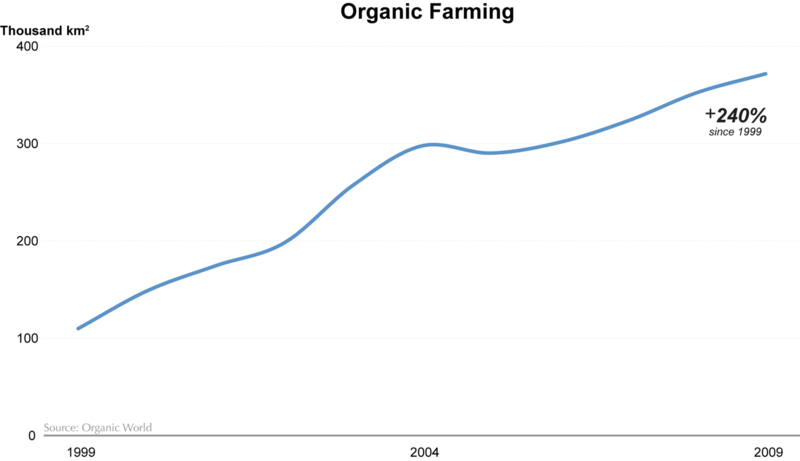 Organic farming, as an alternative approach to the (over)use of natural resources, heavy machinery and chemical fertilizers has been greatly expanding (240% between 1999 and 2009), but nevertheless represents less than 1% of the global agricultural land. Nonetheless, there are some signs of positive change as well. 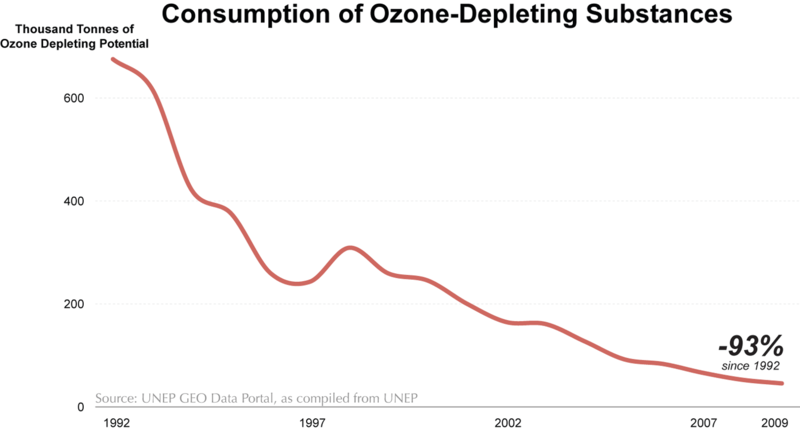 As concern about the ever-increasing CO2 emissions and their environmental impacts rises, the Montreal Protocol, responsible for the phasing-out of ozone-depleting substances (ODS), showcases how an international agreement can lead to success, with a decline of 93% in the consumption of ODS between 1992 and 2009. 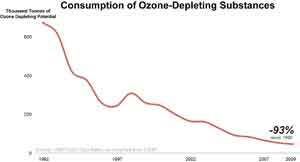 The "perhaps single most successful international agreement" (Kofi Annan) not only helps to protect the Ozone layer, but leads to substantial co-benefits by reducing climate change, as many ODS are at the same time potent greenhouse gases (WMO/UNEP 2010). 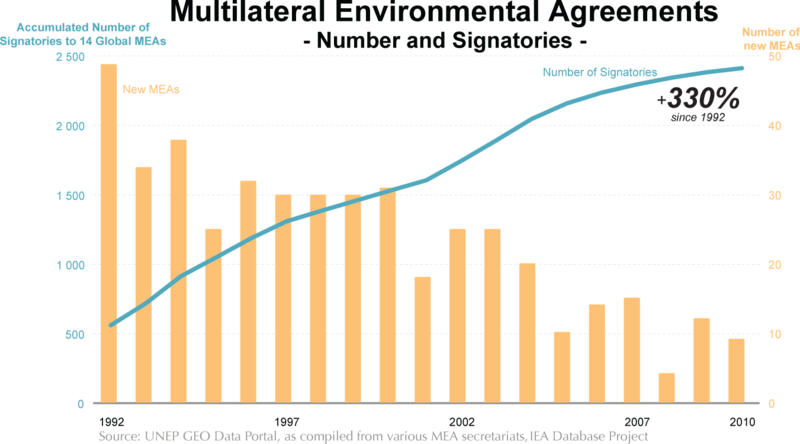 The number of Multilateral Environmental Agreements rose by 330% between 1992 and 2010, demonstrating political recognition of environmental issues. On the side of the private sector, environmental management standards are increasingly recognized, as the adoption of the ISO 14000 standard, which codifies practices and standards to minimize harmful impacts on the environment and achieve environmental performance - an increase of 1500% between 1999 and 2009. Investments in sustainable energy have skyrocketed in recent years, with an increase of 540% between 2004 and 2010, reaching US$ 2011 thousand million. For the first time, new investment in utility-scale renewable energy projects and companies in developing countries surpassed that of developed economies (UNEP 2011d). Along with this, renewable energy supply has seen staggering increases (+30000% for solar photovoltaics, +6000% for wind between 1992 and 2009), although solar and wind energy account for only 0.3% of the global energy supply. Including water and especially biomass (wood, dung), renewable energy comprised 16% of the global energy supply in 2010. Trading in CO2 emissions has grown rapidly (+1200% between 2005 and 2010), but due to only partial implementation and lack of clarity about future regulations in a post-Kyoto regime, the mechanisms are today suffering rather large losses in value. The need to focus attention and resources on improved monitoring and environmental data collection at all levels is essential in order to provide reliable and relevant information for decision-making. 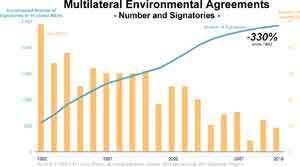 A new commitment to deal with persistent environmental problems and emerging issues calls for cooperation, flexibility and innovative solutions.